UFO FLYING SAUCER - UFO flying saucer spacecraft kit features flashing lights and an energy beam. The pre-assembled electronics requires 14-16 AC/DC. Spacecraft may be assembed with or without telescoping, landing legs. Spacecraft measures 6" in diameter so although labeled for HO-Scale, we believe it would work well with N, HO or O-Scale layouts. Also complete with 4 aliens and 1 robot! See also BH1311 Crop Circle Mat! From Napa Valley to Bordeaux to Ripley, New York, add a classic wine region to your layout. This new vineyard kit includes five staked rows of grape plants with individual vine leaves and grape bunches. Easy to assemble. Requires glue and paint. Corn plant features up to 8 leaves and 2 corncobs. 20 corn stalks are attached together on a corn row which easily makes it possible to plant an entire cornfield. Kit contains 20 pieces. 400 1" Tall 25mm Corn stalks in all! Plastic kit contains 140 individual green fern boughs, 14 pre-painted mushrooms and 14 pre-painted toadstools. HO Scale. Requires glue. Another great innovation by our friends at BUSCH. This easy to build wheat field kit features durable plastic stalks ready for harvest. Stalks are 7/16” (10mm) tall. Each kit will a 4”x 4” square field. A perfect kit for the young modeler. Assemble your own HO-Scale rose garden with 120 red, yellow, white & pink 3/8" tall rose plants. Kit also includes 20 dirt piles on which to place the arrangements. Easy to assemble. Plastic solvent cement is the recommended adhesive. 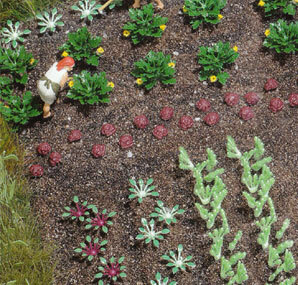 Give your HO-Scale layout a touch of Dutch landscaping. Tulip kit contains 120 tulips containing 5 assorted colors! Ground plates included. Add the "showiest" of perennials to your HO-scale layout! The white and yellow Oxeye Daisy (better known as "Chrysanthemum") kit contains 120 plants and ground stands. Another easy beginners kit! Build a pond tonight! This easy-to-assemble kit has preprinted, depth-effect pond shapes. Just cut and place a clear water film over the pattern to dig a hole! Have a lily pad floating and fish swimming in minutes! Easy to follow graphic instructions included. Requires glue and simple tools. A GREAT BEGINNER PROJECT! NEW for this season this HO-Scale garden variety featuring over 70 pieces including all the plants, pots, garden tools and implements & advertising signs. Kit requires glue & paint. This HO-Scale kit includes 18 hay bales, 6 hay stacks, 18 large rolled hay bales, two tones of hay flock, 2 hay rakes and 3 pitchforks. We're "head" over heels about Busch's HO-Scale cole vegetable kit. Easy 'plug' together kit contains 8 each of broccoli, cauliflower and red cabbage plants as well as 16 heads of lettuce. Plastic solvent cement recommended. Instructions included. Create your own vegetable patch. Perfect for a home garden or combine kits to do an entire field. Kit includes 8 green and 8 red kohlrabi, 16 fennel plants, 8 zucchini bushes and 16 lettuce heads. This set includes over 100 various flowers and plants! Create a large HO garden plot while adding color and cheer from sunflowers to cattails to vegetables, roses, tulips, poppies, and other various summer plants! Grassy pasture meadow featuring 2mm dark grass and taller 6mm lighter buffalo grass. Each piece measures 11½" x 8". Dry prairie range grass featuring short 2mm olive tone dry grass and taller 6mm lighter straw tone grass. Each piece measures 11½" x 8". A multi-textured mat featuring short base grass with tall green tufts and thick straw buffalo tufts occurring randomly throughout. Sheet measures 11½" x 8". All-in-one pond mat featuring realistic rippled water film with marsh reeds and grasses around the shoreline. Lush 2mm green grass outside edge and beyond the wet area. Taller 6mm brownish- tone weeds in the water and along the water's edge. Also includes optional printed fish underlay. Sheet measures 11½" x 8".